Mohamed Salah is targeting two massive wins to sign off an incredible debut season with Liverpool which was honoured by fans and teammates at the club's Players' Awards. 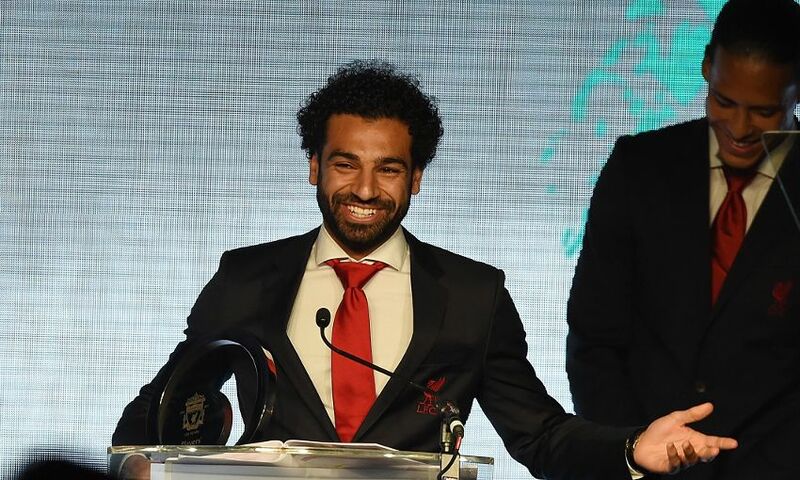 The Egyptian, scorer of 43 goals so far this term, picked up the Player of the Season and Players’ Player of the Season prizes at the annual event at Anfield on Thursday night. But, with two crucial matches remaining this month, Salah was in no mood to rest on his laurels. The Reds require a win or draw against Brighton and Hove Albion this weekend to secure Champions League qualification for next season, and then face Real Madrid in the 2018 showpiece in Kiev. Congratulations on your awards. What does it mean to you? It’s an honour, to honest. I’m very happy to win these awards, especially from the players and the fans. I’ve had a good season but without the players it would be very difficult. We’ve had unbelievable moments together and we’ve sacrificed every day to improve ourselves. We still have two games to go and we have to win them. I’ve had a very good season, all of us [have]. Now we are in the Champions League final and we have one [league] game to win or draw to be in the Champions League next year. So we have two finals and we have to think about that. Who has helped you most in this fantastic season? All of [the players]. I can’t say only one name because all of us try to help each other to improve ourselves, to give more and to push ourselves. We are a group. We fight [for success] every day in training and in the games. I work hard to help the team score goals. I’m very happy about the season – let’s finish it in a good way. What is the target in the final two games? The target is to be in the Champions League next year and to win the Champions League in the last game. If you play a final, you can’t play to draw or lose – we’ll play to win the Champions League. But first we have Sunday; we have to think about that first to make sure we play in the Champions League next year. Then after we’ll play the final. How special an occasion will the Champions League final be? It’s a special season for me and all the players. It’s very special to play a final. Everyone is very excited. It’s not going to be easy, we know that, but we will give what we have 100 per cent to win the game. I’m very excited.